I own a 2005 Accord coupe. I am planning to do some modification to the High beam and low beam wiring. I am more interested in the signal from High and low beam switches. Since my project will require more relays I want to place everything near the existing relay. But I am not able to locate the relays. Where can I find the relay for headlights? I am a newbe so please tell me in details. It's part of the relay control module, which is built into the under-hood fuse/relay box. Thanks Redbull. I checked the fuse/relay box under the hood but other than fuse, i couldnt find any relays for Headlights. I have attached a pic of the fuse box. Last edited by accord05thirteen; 09-11-2014 at 06:45 PM. The relay control module is only partially pictured in your photo. (See attached). There are control blocks and various relays (for horn, headlights, taillights) incorporated into the module. It not a traditional relay that you can pull and replace. The module is built into the fuse/relay box. Thanks. How can I get access to it? Or If I get access to High and low beam trigger from the switch it would be great. Also, the II of key. 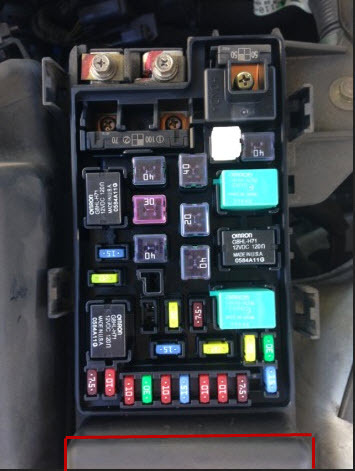 Can I access the Headlight switch and Key II or III from under the dash fuse box? I have seen there is a harness, but not sure if that would serve my purpose. Please help me with a pic or diagram. Explain what your project suppose to do.